November Challenge Winner & a new record!!! We wanted to say a BIG Thank you to all who particpated in our November challenge!! We had 165 entries making this our biggest challenge to date!! And the entries were just gorgeous. Please check back tomorrow for a new fun challenge with a great prize up for grabs! Please email your address to ( lora at onecrazystamper dot com ) to claim your prize! Our December Challenge starts tomorrow, so check back!!! Whether you like to color or if you don't like to color this set is for you! 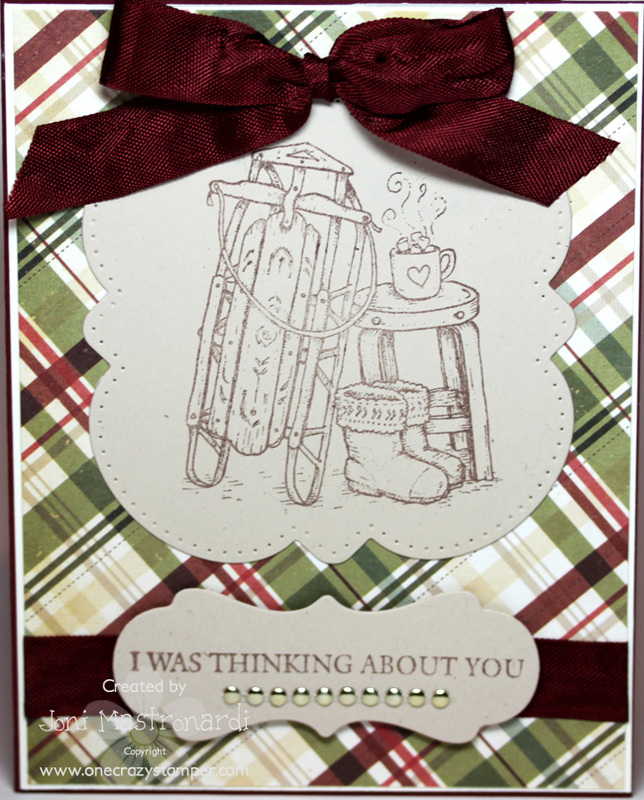 This week I have the sled and hot cocoa stamped with Memento Rich Cocoa Brown ink unto natural cardstock. I cut out the image with a die and added a sentiment from Flourishes In Out Just Because. Designer paper is Simple Stories Handmade Holiday. Last week I stamped the image and colored it with copics. Either way this stamp set is a lot of fun and very versatile! Hi all, Madge here for another Wonderful Wednesday at OCS and a project using "Krafty Kate" a Saturated Canary preorder stamp from OCS. How appropriate for that "crafty person" on your card list any time of the year! Materials used: Xpress It Blend Cardstock; Tuxedo Black Memento Ink; Tim Holtz, Brushed Corduroy Distress Ink; Copic Markers: R00, E11, R20, W0, W2, Y26, Y28, R39, R22, YG91.YG93,YG95,YG97, BG00; White gel pen; Ice White Viva Decor Pearl Pen; Spellbinders, Lables 23; Papers from BoBunny "Noel" collection. Buttons, snowflake punch and ribbon from stash. 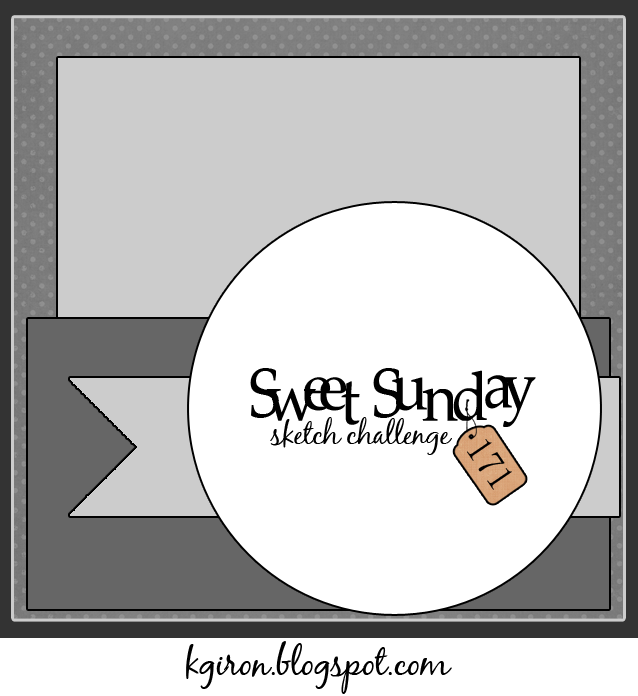 You still have time to get in on the prizes for the November OCS Challenge. "Anything Goes", until the end of the month! See you there! 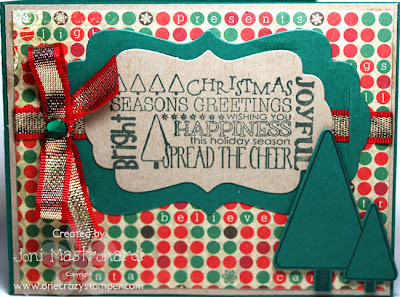 ...and that means that it's time for my post here at One Crazy Stamper!!! This adorable image is from Nellie Snellen and is entitled "Hokey Pokey". To color the image I started by choosing paper from My Mind's Eye Lost & Found collection, and then matching my colors to the colors in the paper. The image was matted and layered onto two papers from the MME collection, the flowers were airbrushed with Copic colors to match the dp, and the sentiment and lace are from my stash. You still have a couple of days left to enter a fabulous project in this month's Anything Goes challenge. For details just click on the sticky at the top of the blog. Hello! 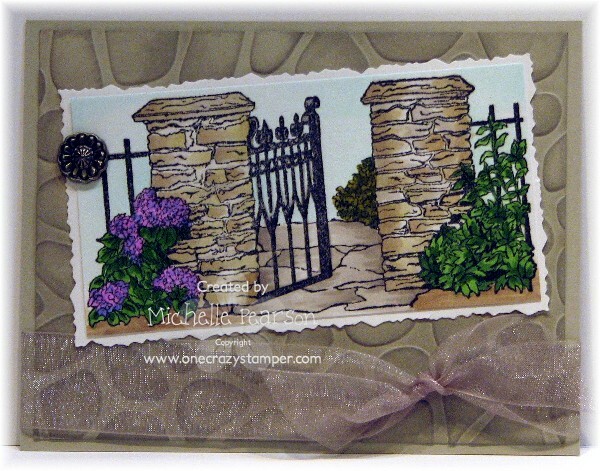 Today I have a gorgeous image to share with your from FrogsWhiskersInk called Trish's Stone Gate. I colored my image with Copic Markers; YG67, YG17, G99, YG95, YG91, BG0000, B66, V04, T4, W5, W3, W1, E44, E43, E42. I trimmed the image and layered it on white cardstock which I trimmed with a Fiskars deckle edged scissors. I added Tim Holtz Pumice Stone Distress Ink to my embossing folder, added a touch of sheer ribbon and a decorative brad for my finishing touches! It is another fabulous Sunday today, as well four weeks to Christmas Day. The quest is on for that elusive and great present. 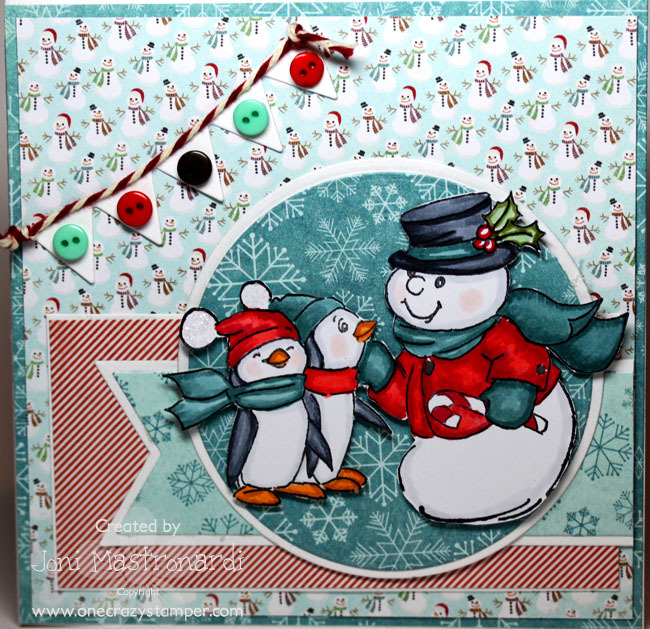 For my card today for One Crazy Stamper, I used the Round Snowman Ornament stamp from High Hopes Rubber Stamps. There are still a few days left to enter this month's challenge which is "Anything Goes". 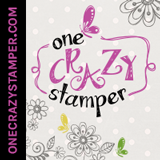 While you are at it check out Lora's store One Crazy Stamper for some great products and amazing deals. Gift certificates make a great Christmas present. See you on the 1st for another great challenge. Hope you are having a fabulous week! I am enjoying a few days off from school but I still have stacks and stacks of books and papers to get through! I will be very, very happy when this school semester is over so I can spend some quality time with my stamps! Today I have a very simple card! I needed a flat note card type card that would fit easily in the mail. I used Cat Trio from High Hopes. If I am sending something through the mail I very rarely use pop ups or bulky embellishments because they are sooooo much harder to mail. 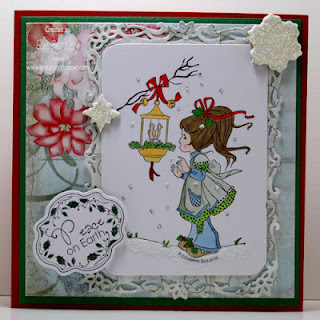 Today I have Snow Day from Flourishes available at One Crazy Stamper. I colored the image with copics: R29, R27 and R22, E07, E29, E50. I airbrushed the background with W3. I used the Spellbinders Label 26 die to layer the focal image. Hi everyone Cindy here Welcome to my One Crazy Stamper project. I have used this SWEET Penny Black stamp (Sweet Dreams). My paper is My Minds Eye (Stella Rose). Hi all, Madge here for another Wonderful Wednesday. I was very reluctant to post my project for this week as Shari (our Terrific Tuesday girl), did a absolutely marvelous project using the same image. (We both have excellent taste - !! Amazing how two images the same can turn out so differently. I stamped my image on Copic Xpress It Blend Cardstock, with Tuxedo Black Memeno ink, colored it with copics and die cut the image. Barn Door distress ink was sponged onto the die cut to give it a bit of color. I also added some machine sewing and then sponged on Versamark and applied White Embossing Powder. Tuesday is here again, so for this week's project for One Crazy Stamper I have colored up the adorable "Holly" from Wee Stamps by Whimsy Stamps. 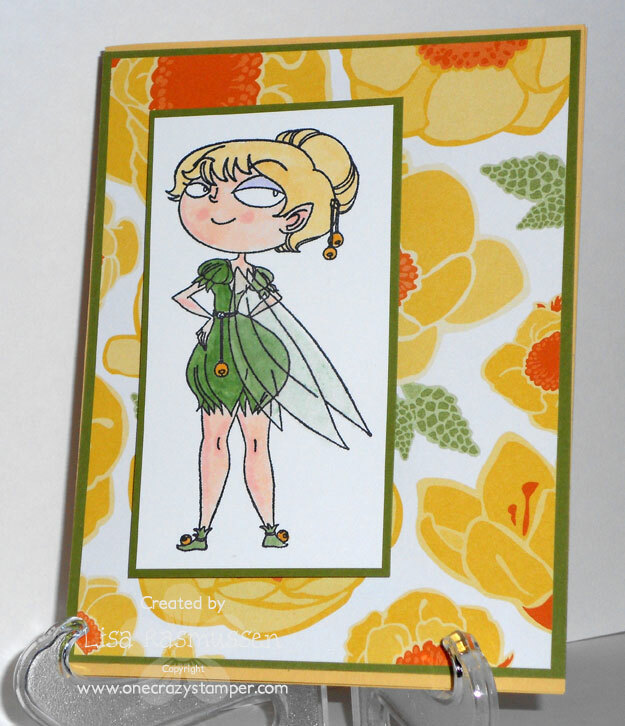 The image was stamped on Copic Xpress it cardstock with Memento Tuxedo Black ink, and colored with Copics. Crystal stickles add an extra glimmer to the wings, snow, and bells on the image. The dp is from last years Bo Bunny Father Christmas collection, flowers are from Wild Orchid and the sentiment is from Waltzingmouse. You still have ten days to enter the monthly challenge here at One Crazy Stamper, and this month the theme is the ever easy ANYTHING GOES. Check out the design teams wonderful projects, then get creative, and enter to win a fabulous prize. 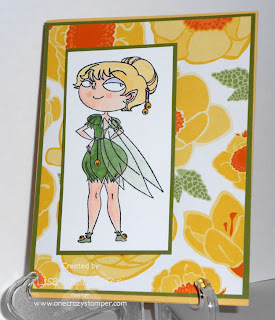 Today I'm sharing project using the Sweet Blossom image from Whimsy Stamps for my One Crazy Stamper post! I colored her up with Copic markers: B99, B97, B95, B41, YG67, YG17,YG13, E02, E00, E47, E44, E43, E31, YR27, YR14, Y35, Y21. I distressed the image edges with Tim Holtz's Distress Inks in Tumbled Glass and Peeled Paint. I love using embroidery on a card to dress it up a bit. This is the first time I used three different coordinating threads to frame my image. 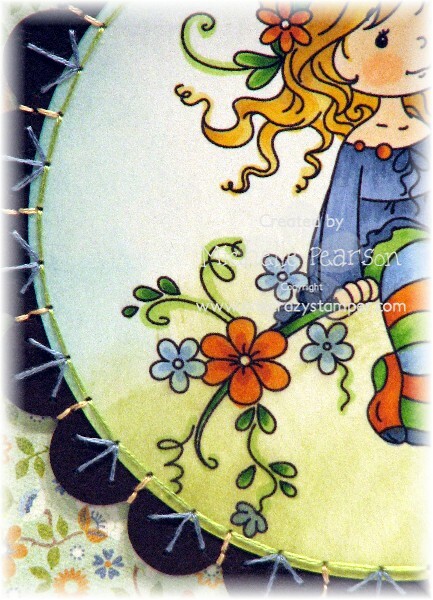 I create a pattern I like, pierce it freehand and then stitch it up! Designer papers are from BasicGrey's Clippings collection. I then framed the panel in a 9 x 9 inch frame that my husband made for me. I left the glass out for the purpose of the photo. 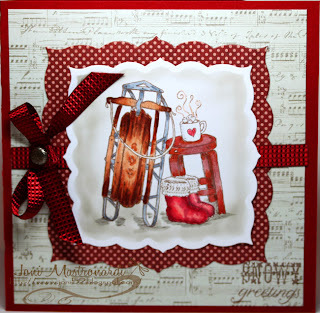 For today's post for One Crazy Stamper, I have used this cute stamp called Sledging By (a Mulberry Wood design from Crafter's Companion). Flower Soft: Christmas Green (added to the trees). 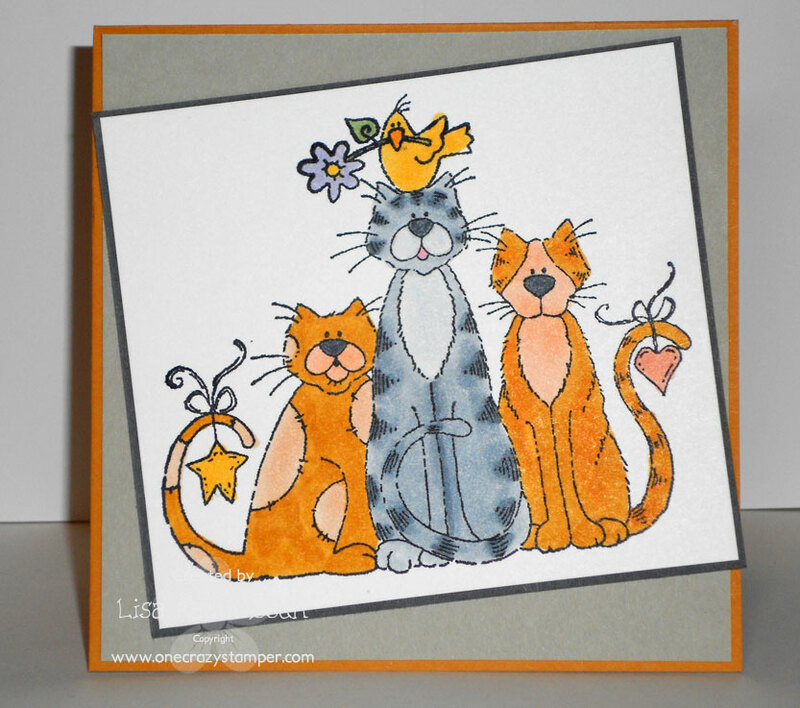 There is still time to enter this month's challenge "Anything Goes" for a chance to win a Whimsy Stamp package. As Christmas is just around the corner, now is the time to make your wish list for Lora's store One Crazy Stamper for all the new products that are coming. Have you seen the adorable Saturated Canary line of stamps? These are pretty new to me but the first time I saw these I knew I HAD to add them to my stamp collection! They are soooo cute! I used the Queenie and Princess image. Love how sweet and girly this image is! I colored with my copics and added a hint of lace and some dots to finish off the card. Enjoy! 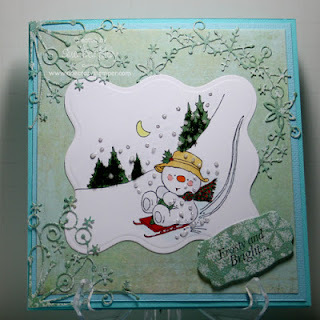 Today I have the Happy Holidays Stamp and Die set from Your Next Stamp available at One Crazy Stamper. I stamped the sentiment with Memento Northern Pine ink unto craft card stock. I cut out the image with a die and layered it onto green card stock. The trees were stamped cut with the die from the Holidays set. Designer Paper is Bo Bunny Rejoice. Don't forget to check out our challenge blog: Anything Goes. Okay, today is a surprise post from me - seems lately I have been creating cards at a faster pace than normal, so here's one of my latest. 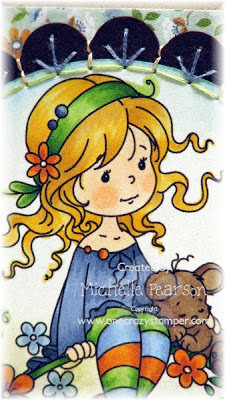 This super cute image is from Penny Black and the artist Mo Manning and is entitled "Winter Fairy". Hi all, for another Wonderful Wednesday at One Crazy Stamper. Since it is my turn to post a tutorial for the OCS DT, I have chosen to show you what I did to create a "motion" scene. 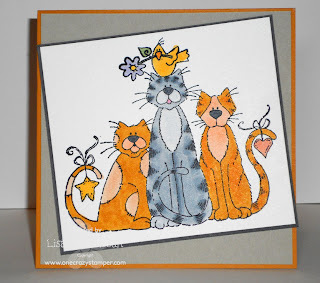 I am using a High Hopes stamp called "Choppers Chillaxin" available at One Crazy Stamper for an insanely low price, as are all One Crazy Stamper's items. Here is my finished card. I kept it very simple with layers and a few embellishments. November's Challenge for One Crazy Stamper is "Anything Goes -- join in on the fun for some "free stuff". Now, on with my Tutorial. 1) Stamp your image on far right or far left of piece of white Cardstock (depending on where you want your image to finish up). 2) Stamp your image onto a Post-it Note making sure you stamp on the top side of the sticky part. (this will allow you to temporarily adhere your mask to the stamped image. 3) Cut the right or left side of your mask depending on which side you want your image to come from. No need to be perfect - just a "roughy cut outside the lines". 4) Place your mask over your stamped image. 5) There is no need to re-ink your stamp for your second image - just "huff" on the ink to refresh it. Stamp your second image. I didn't align my images as I wanted them to appear to move and jiggle up and down with the motion of the waves. 6) Stamp your image for the 3rd time - huffing on your stamp once again. The image does not have to be "all there", it should be just a blur. 7) Proceed to color your image. The first image you stamped will be in full color. The second image will be lighter, and the third image will be a "blur of color", very pale in comparison to the first image. Here is a larger version of my finished card. I kept the embellishments very simple and purposely rough cut around the image and placed it tilted on the paper to give the illusion of bouncing on the waves. I hope you've enjoyed my tutorial, if you have any questions, feel free to email me. It's Terrific Tuesday here at One Crazy Stamper, so that means it's my turn to show you a project! Since the challenge theme for this month is Anything Goes, I have not made a card today, but instead made a candle for Christmas giving. The image is an adorable House Mouse stamp called Christmas Cookie Eaters, that I stamped with Staz on ink on to tissue paper, then colored with Prismacolor pencils and Gamsol. The edges around the image were torn and inked with a Gathered Twigs Distress Ink pad. The sprinkles on the cookies were colored with Siren, Gold Lame, and Luscious Lime Smooch metallic paint accents to add a shimmer to the image. The candle was finished with a braided ribbon trim from my stash. Check out the challenge this month by clicking on the icon at the top of this blog, then get creative, and enter to win a wonderful prize from One Crazy Stamper. You still have a couple of weeks to enter to win, win, win!!! 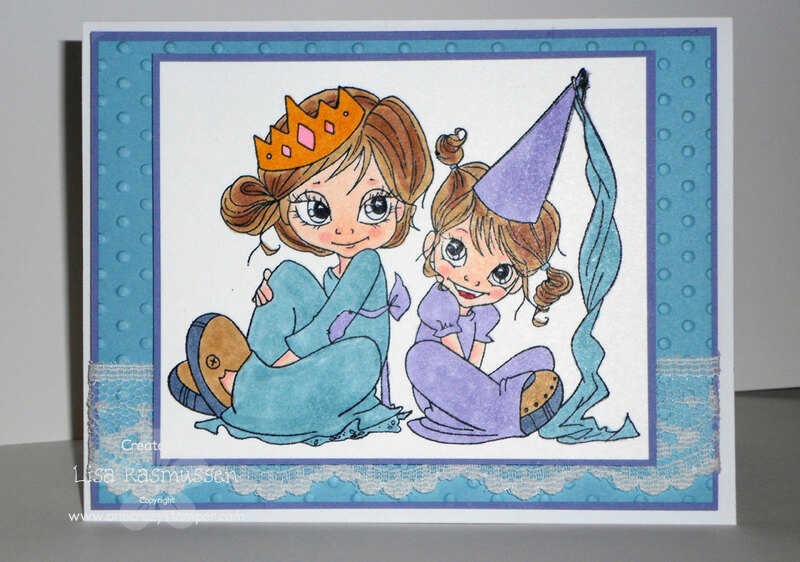 Today's post for One Crazy Stamper features the adorable Heidi image from the Wee Stamps collection from Whimsy Stamps. I colored her with Copic Markers: B99, B97, B95, B93, E43, E42, E02, E00, BG000, BG10, E31, Y35, Y21. 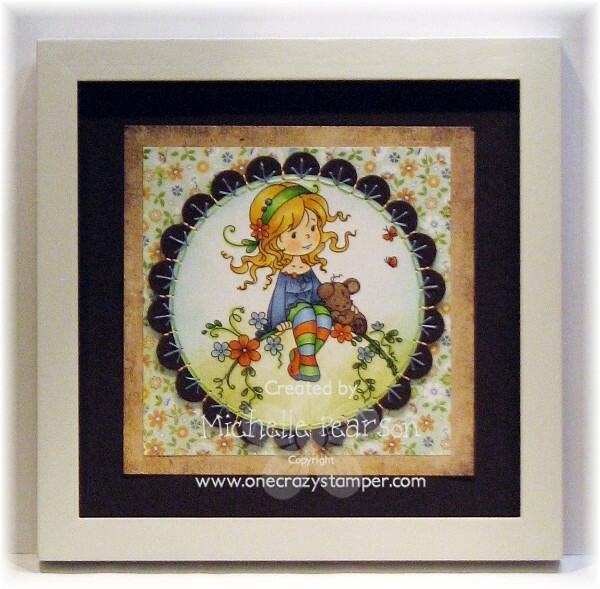 I framed her with Spellbinder's Labels Four Die and distressed it with Tim Holtz's Tumbled Glass Distress Ink. I further framed her with the Spellbinders' Fleur De Lis Rectangle Die that I cut the center out of. Designer paper is from Bo Bunny's A Gift Of Love collection. The sun is finally shining after a week of rain here in Ontario. For my card today for OCS I have used this adorable image called Two Turtle Doves designed by Elisabeth Bell for Whimsy Stamps. Miscellaneous: My stash - Polar Bear Glitter (Art Institute), Chipboard Snowflakes. I used this glitter to cover the snowflakes, and Warm Highlights from Glitter Ritz for the bottom of the image. 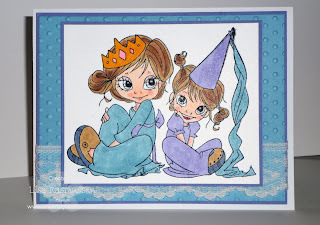 There is still plenty of time to enter this month's challenge "Anything Goes" for a chance to win Whimsy Stamp Package. Don't forget to check out Lora's store OCS for some amazing products and deals. It has started to get super cold here! Of course California cold is pretty mild but it hasn't helped that I have had that nasty cold that has gone around! I have had it for over a week. Usually I can just take a day and work through it but this one has had me down since last Thursday! I did find time to play with the adorable Kraftin Kimmie Tinkerbell though. I did keep it pretty simple and it is hard to tell in the photo but I added some really pretty shimmer to her wings. Enjoy this months challenge of anything goes! and used the circle and fish tail die-namics to layer my image.